Soft, moist and fluffy cheese cake. 2. Stir cream cheese using a whisker until melted, blended and creamy. immediately remove from heat. 3. Add flour and cornstarch into the cream cheese batter. Quickly stir until blended. 5. Beat egg whites until fluffy, add cream of tartar. Beat again until fluffy. Add sugar gradually and beat until blended and egg whites become stiff. 6. gradually add and whisk the egg whites into cream cheese batter. stir until well blended. 7. Pour batter into 20 cm diameters baking pan which has been spread with butter, then place containing pan into a larger one and fill with hot water about 1/4 of the pan. (aun bain marie technique). 8. Heat oven with 160 Celsius and bake around 50 minutes. 9. Allow cake to cool slightly, then remove cake from pan. 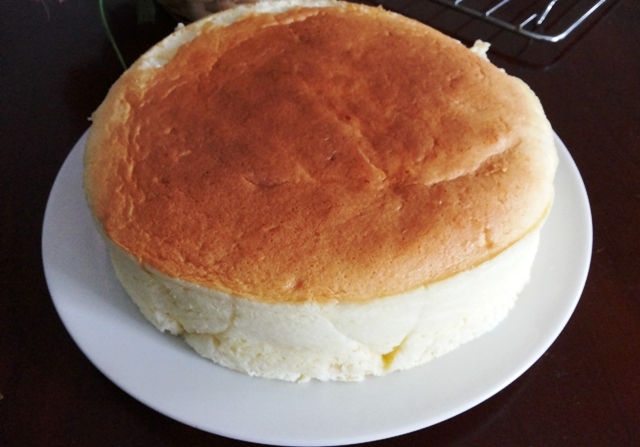 Usually, to make Japanese cheese cake is using removable baking pan (loyang bongkar pasang), Because i dont have it so i use usual baking pan than place a baking paper into the pan and spray some butter both in the pan and baking paper. if you are using removable baking pan, wrap the bottom of baking pan with aluminum foil. to avoid water from pot come into baking pan.